BlackBerry dominance in D.C. is ending according to survey | BlackBerry Blast! The BlackBerry has been dominating Washington D.C. for years now. 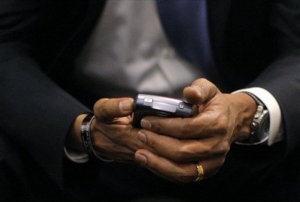 Most hill staffers carry BlackBerrys, and even the President made news when he told the Secret Service he was keeping his BlackBerry after he was sworn in, despite their suggestion that it was a security risk. These days, BlackBerry seems to be losing its mojo in D.C. According to a National Journal survey, 77% of hill staffers still have BlackBerrys, but that number is down from 93% in 2009. That's still not bad, but the more troubling stat is just 1 percent of users surveyed said they were planning on buying a new BlackBerry. It seems Apple's iPhone is to blame. Despite warnings from IT departments that the iPhone doesn't provide the same security that the BB does, more and more people want the iPhone. Apple�s iPhone has taken a chunk of the BlackBerry�s market share, the online survey found 41 percent of Capitol Hill staffers surveyed said they have an iPhone, as do 42 percent of private-sector workers and 27 percent of federal executives. In 2009, iPhones were rarer: Of the 1,184 Washington workers surveyed, just 13 percent on Capitol Hill, 15 percent in the private sector, and 9 percent in the executive branch reported having one. RIM really needs to step it up in a big way, but sadly, it doesn't look like it's going to happen. I'm really tired of posting negative news about BlackBerry and I hope RIM pulls a rabbit out of its hat.